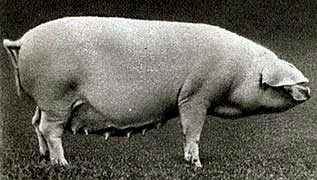 Urzhum pigs were developed in the late 1950s in the Kirov region of Urzhum, Russia. They are the result of a long of crossing of local pigs with Large White boars. They are hardy and have good meat qualities; and as such can be used in a system of intensive pork production on an industrial basis.